Here is a possible paradox ... in what is called the "Backstop" in EU-UK negotiations. It concerns the changes that must and must not occur at the Ireland/Northern Ireland border. How can free passage of Irish EU citizens (Irish citizenship may be claimed by any Northern Ireland citizen) to and from the UK be maintained after a Brexit deal? Moreover, how can the border be maintained/done away with if there is a no-deal Brexit? The United Kingdom is due to depart the European Union on March 29, or I should say scheduled to depart. There may very well be a delay of the date on the calendar of three months. Basically, the Prime Minister's first 'plan' failed to pass the Commons. She is presenting a tweaked 'plan' for a vote presently, and will then offer a 'no whip' vote on a delay measure. In between, she has planned a vote to see if parliamentarians are up to approving a 'no-deal' deal -- ie, crashing out of the EU, proceeding without a map of transition or any formalized divorce agreement. So, everything is going along so far so good. On the other hand, both the Conservatives and Labour have lost handfuls of MPs who renounced their former parties, since the most recent Brexit lurches. A no-whip vote is when the Prime Minister frees ruling party MPs to vote their individual druthers, without discipline from the top. This means the delay vote is about the only vote that should be assumed to pass the Commons if the tweaked Plan doesn't. Finally, note that Labour leader Jeremy Corbyn has declared the need for a second referendum, which is just historically-precedented enough to allow him to whip his party his party if he can force a motion. Prime Minister May must be having the time of her life. About the only thing that could top this week would be May calling a snap election. Yes, today is March 12, the day of a Commons vote on the negotiated deal between May and the EU. Guess what? First vote failed. Next step, no-deal Brexit goes to a vote. What a shambles. Think of all the money and effort these elites are deploying to get to No Deal. They don't like it one bit that the people are refusing to be led by them. But what the hell, it's their money and time. If they push too hard to thwart the vote of the people they thought they were ruling and still want to rule, though, it could get real ugly, especially when they discover how little they actually rule. The Fourth Reich isn't going to just give up Britain. Extraordinary moments in the British House of Commons. Followed by more extraordinary actions in the British House of Commons. The Speaker denied the government a third "meaningful vote" on the Brexit deal negotiated by Theresa May. The first two votes failed, the second by a large majority. The Brexit schmozzle continues to schmoz. Parliament 'took back the power' from the Prime Minister, and forced a round of "indicative" votes -- ie, 'which of these options do you favour?" What happens now? Good question, no answer comes to mind immediately. Theresa May has declared that she will step down as prime minister -- if the Withdrawal Agreement she negotiated with the EU passes the House of Commons. And if it does not ... barring any other votes passing any deal, the UK will crash out of the EU on ... April 12 (or, yes, on May 22, the day of European Parliament elections if -- if if if -- another vote succeeds in passing the WA). But what the hell, it's their money and time. There won't be enough francs or pounds to buy snails. Oh, Yeah. Did anybody notice I got rid of that darn cat? Though she lost an ear she is still thriving. White cat. Cancer. Real white cat? Cancer. Who knew? Sparks's other ear is mottled but not cancerous. Today is the day after the day the United Kingdom was supposed to have left the European Union. The way forward is ... unclear. [...] The EU has given the U.K. a deadline of April 12 to either leave with no deal or propose a different plan. That would require a lengthy extension to the Article 50 negotiating period, meaning that the U.K. would have to field candidates in the upcoming European Parliament election in May. On Monday, MPs will again take control of the parliamentary timetable from the government to hold a series of votes that could yield a majority for a different form of Brexit. 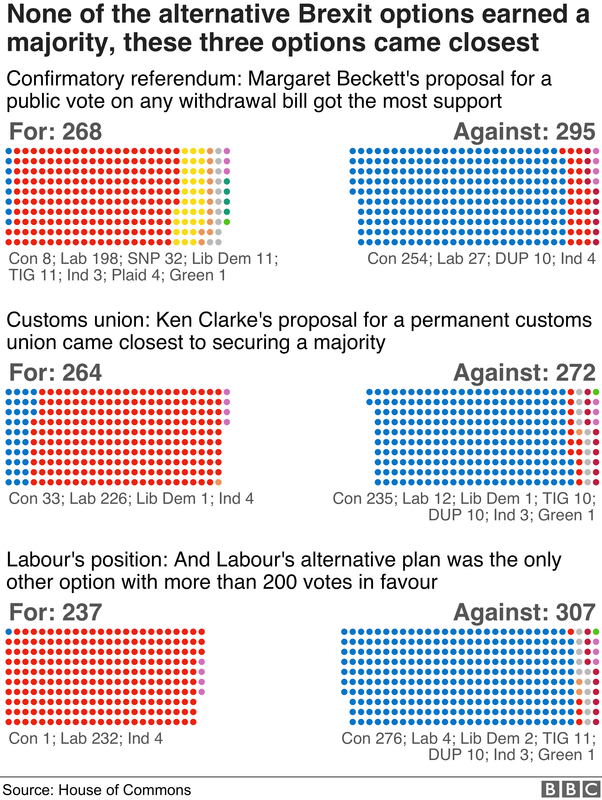 In the first round of "indicative votes" on Wednesday, a proposal for a customs union with the EU put forward by veteran Tory MP and former Chancellor was just eight votes short of a majority. May has refused to be bound by the process even if it does yield majority support for an alternative course of action. "If the government refused and Theresa May felt she could not implement what parliament identified as a way of leaving the EU then we have to think very hard about whether a cross-party coalition ... could do that in order to make sure the U.K. does leave the EU in an orderly fashion," she said. Take one portion of schmozzle and one portion of shambles, and shake shake shake. "May asks for Labour's help on Brexit." Theresa May has obtained an extension of the Brexit schedule, until All Hallows Eve. If she can maneuver the Commons into accepting her negotiated withdrawal agreement before that time, Brexit will happen in an 'orderly fashion.